If you take a left onto Sheldon street while heading east on 16th (turning before the HWY 65 underpass), you will see two small house like structures surrounded by a chain-link fence filled with rows and rows of garden beds. Outside a sign reads, “Felege Hiywot Center-Youth Educational Program”. Black-eyed Susans, Queen Anne’s lace, buzzing bees, and tall prairie grass greet you as you enter through the gate. Walking into the plot, you can almost hear the hum of growing things. The smell of basil, rosemary, tomatoes, and collard greens fill the air punctuated by the sounds of chickens clucking. It is a small plot pulsing with life. The same could be said about FHC’s founder and Executive Director, Aster Bekele, who welcomed me with a wide smile and a laugh. Aster is a small Ethiopian woman who is full of energy. We sat down on plastic chairs at the gathering room’s tables while one of the center’s volunteers washed vegetables in the kitchen. Felege Hiywot Center’s story begins with second-generation Ethiopian immigrants. 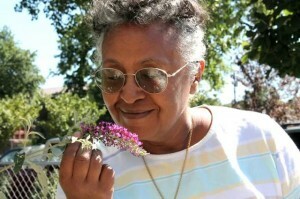 In 1974, when Aster was eighteen, she emigrated from Ethiopia to the U.S. to pursue her degree in chemistry. During her schooling she began living at 25th and Martindale in Indianapolis where she volunteered her time as an after-school tutor available to help kids in the neighborhood with their studies. As she worked with these children in her neighborhood, she shared with them about the lives of children in Ethiopia. Her stories made an impression on the kids. They came to realize how fortunate they were compared to the children in her stories, even though in Indiana they may be considered under-privileged. She graduated from IUPUI with a degree in chemistry and began working with Eli Lilly & Co. Once employed, she continued to tutor the children in her neighborhood as well as continue to teach them about Ethiopia. When she started working with the second generation Ethiopians in her neighborhood, something that she found disturbing was the complete lack of knowledge these youth had of their cultural heritage. The students were good in school but they had a hard time understanding their parents since their parents’ English was broken at best. The parents were frustrated with their children since they saw them becoming more American than Ethiopian. There was miscommunication, anger, and resentment building in their homes. Which resulted in the kids having identity crises feeling required to act Ethiopian at home and American out of home. This created a big generation gap where parents were afraid and children felt angry. Entering into these places of friction set a trajectory for the rest of her life. For twenty-seven years she volunteered her time to help the local resident neighborhood kids who were faced with crime, drugs and violence, as well as second-generation immigrant kids who felt adrift in cultural ambiguity. Upon retiring from Lilly she opened the Felege Hiywot Center as a place for young people from two cultures to seek new opportunities, stay out of crime, as well as learn and share about their cultural backgrounds. FHC teaches elements of STEM through gardening, sponsors a garden for kids to come and learn about agriculture, fosters conversations regarding cultural interaction and experience, as well as partners with an orphanage in Sebeta, Ethiopia to raise awareness about and funds for the children there. What was your plan for FHC in the beginning? “The core of this program was to teach. I wanted to teach science. But you know what, in the beginning, I was hitting a wall. I would wonder, ‘Why is it that the urban kids hate science? Science is fun! I love science.’ I was talking with some of the kids one day and asking them what they wanted to do. One girl said, ‘Our school is dirty, can we plant flowers?’ ‘Whoa’, I thought. The light went on. I realized that I needed to fit science into their interests. What were some of the difficulties you experienced in the beginning with FHC? “You know, in the beginning, I don’t think the kids thought I would stay. They’d come in, we’d do things, and then they’d ask if I would be there the next week. Each week they would ask. Finally, I asked them, ‘why do you keep asking me this?’, and they would say, ‘because most people are here for eight weeks and then leave.’ It wasn’t until we started planning our garden, saying ‘It’s spring, what do you want to be planting here? What should we plan for the Fall? What do we want to do over the winter?’ that they began to trust us. It was this planning year after year that convinced them that we weren’t going to be going anywhere. By brining them into the planning they began to trust and feel secure. How does understanding where you come from make you a better community member? “It’s a beautiful thing. That understanding has to be built. Because when you are working with the younger generation, and teaching them about why their parents are the way they are, it takes away any defensiveness or hurt they’ve felt in the past. Any parent that comes from anywhere in the world wants their child to keep their traditions and their old ways while living in America. This creates conflict because the child now has to live two lives. It is intergenerational stress. In the house they are Ethiopian, Honduran, Mexican, but outside they are American. How have you changed since opening FHC? “I do not do what I did in the corporate world. The kids don’t run on a 9-5 schedule. I can’t live my life saying, ‘let me call that person’, ‘let’s schedule this’, lets get this on the books’, I do it as the kids need it. People call me and say, ‘do you need this? Do you need that?’ I have never made an email list. People always come to me and offer themselves and their resources. This happens all the time. Every time we say we need something, it happens. It’s a miracle. I had to get rid of this need to have things controlled. I got detoxed out of that mindset. I use it as a tool now. It controlled me for twenty-seven years, but now, I know how to use it. If we are going to allow the kids to have a voice in this then this structure, this 9-5 style wasn’t going to work. They needed to be spontaneous. Their ideas needed to flourish; they couldn’t be constrained by my calendars. It was torture at first, but their excitement, their smiles, and their hugs just said, ‘This is great. This worked. They’re happy.’ If this is how things work, I don’t want to change it. Also, there is no way we could’ve survived if it weren’t for our skilled volunteers. No way this could happen if I wasn’t able to donate 100% of my time to FHC. What made you decide to stay in Indiana rather than go anywhere else? If you are interested in volunteering time or resources to the Felege Hiywot Center you can reach them online at fhcenter.org, or by telephone at (317) 545-2245. You can also visit them at 1648 Sheldon Street from 10am-2pm on Saturdays to buy some of their delicious produce from their Farmstand. Make sure to get there early before their produce runs out!